Hey kids! Thanks for sticking with me through this week. A lot of the topics I’ve been covering can be incredibly difficult, but it’s worth understanding the risks associated with eating disorders, along with all of the resources available for prevention and recovery! If you’ve missed any of the posts, I’ve covered eating disorders and diversity, eating disorders in athletes, and eating disorders and bullying. Today’s theme is dieting: what it is, what it isn’t, and how it can lead to disordered eating. According to NEDA, 35% of “normal dieters” progress to pathological dieting. Of those, 20-25% develop an eating disorder. That’s a scary high percentage. When you think about it, it’s not too surprising that dieting can lead to an eating disorder. When the diet industry depends on people feeling bad about their bodies in order to make a profit (up to $60 billion annually, by some calculations), you can be sure that they’re going to work pretty hard to make sure you never feel like you’re ‘good enough’. One of the most important points I want to make here is that there are many different kinds of eating disorders that can be triggered by dieting. The one I’m going to focus on today is one that you may not have heard of: orthorexia. While orthorexia is not yet recognized by the DSM, it’s a word and a diagnosis that is gaining traction in the medical community. Orthorexia is characterized by an obsession with eating ‘healthily’. Someone who is orthorexic may not realize they’re suffering from an eating disorder; orthorexics don’t necessarily restrict the amount of food they eat (although this is often a symptom of the disorder), but they do restrict the kinds of food that they eat, focusing on ‘clean eating’ or only eating ‘good’ foods and avoiding ‘bad‘ ones. Separate food fad fact from myth with this handy infographic. It kind of makes sense that orthorexia would be an up-and-coming eating disorder. With diets like the Paleo diet that claim to eat only what the body is ‘meant’ to eat, and people without any kind of gluten intolerance promoting gluten-free ‘lifestyles’ as somehow healthier than those containing gluten, the language around dieting and nutrition these days has shifted from talk about weight to a more moral kind of language. People ‘eat clean’ (implying that everyone else eats dirty?) and divide carbs into ‘good’ or ‘bad’ carbs. This language creates a culture around food that can lead to some unhealthy behaviors. The thing is, in a world where unhealthy food is often more affordable and more accessible than healthy food, eating more healthily can take some time, effort, planning, and attention. While there’s nothing inherently wrong with this, it’s easy to see how it can get out of control. However, changing your eating habits, going on a diet, and having an eating disorder are all different things (although the lines between them are often blurred). Here are five significant differences between anorexia and diets. Concerned that your interest in healthy eating may be going to far? Take this orthorexia self-assessment. Generally concerned about your eating habits (or those of a friend)? Here’s an online disordered eating self-assessment. Online assessments are a starting point, but they’re no substitute for an in-person discussion with a professional. Find a screening in your area here. If you’ve been reading my posts this week, you know you can join the conversation about eating disorders this week by using the Twitter hashtag #NEDAwareness all week. 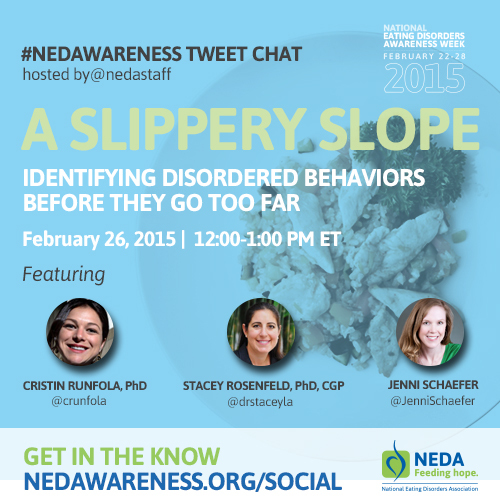 Today at noon Eastern Time, use it to join a tweet chat: A Slippery Slope: Identifying Disordered Behaviors Before they Go Too Far, featuring Cristin Runfola, Stacey Rosenfeld, and Jenni Schaefer. Update: NEDA has posted a blog that discusses the dangers when ‘healthy’ eating goes too far.